There are at least two versions of this story in the literature. As with the story of the two monks, one version is common in the German pamphlets and views Dracula’s actions unfavorably while the other version is common in eastern Europe and sees Dracula’s actions in a much more favorable light. In both versions ambassadors of a foreign power visit Dracula’s court at Tirgoviste. When granted an audience with the prince the envoys refused to remove their hats, as was the custom when in the presence of the prince in Wallachia. Angered at this sign of disrespect Dracula had the ambassadors’ hats nailed to their heads so that they might never remove them. In the German version of the story the envoys are Florentine and refused to remove their hats to demonstrate their superiority. When Dracula asked the ambassadors why they wouldn’t remove their hats they responded that such was not their custom and that they wouldn’t remove their hats, even for the Holy Roman emperor. Dracula immediately had their hats nailed to their heads so that they might never come off and had the ambassadors ejected from his court. In Germany and the West, where the concept of diplomatic immunity was at least given lip service, this was held to be an act of barbarity against the representatives of a friendly power. In the version of the story common in the east, the envoys are Turkish. When ushered into the presence of the prince, the Turks refused to remove their Phrygian caps. When questioned they answered that it was not the custom of their fathers to remove their hats. Dracula then ordered their hats nailed to their heads with three nails so that they might never have to break such an excellent tradition. 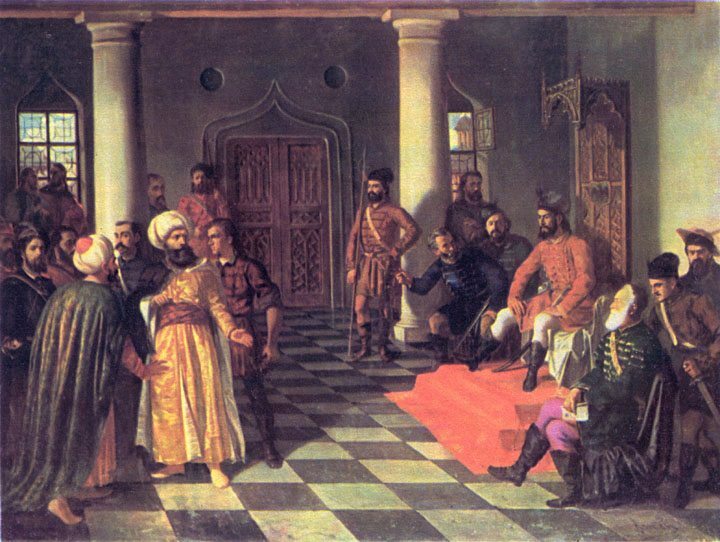 The envoys were then sent back to the sultan. In the east this was held to bee a courageous act of defiance in the face of the power of the Ottoman sultan. It should also be noted that the nailing of hats to the heads of those who displeased a monarch was not an unknown act in Eastern Europe. Apparently the princes of Moscow when faced by unpleasant envoys occasionally used this method. Much of the information we have about Vlad III comes from pamphlets published in Germany and Russia after his death. The German pamphlets appeared shortly after Dracula’s death and, at least initially, may have been politically inspired. At that time Matthias Corvinus of Hungary was seeking to bolster his own reputation in the Holy Roman Empire and may have intended the early pamphlets as justification of his less than vigorous support of his vassal. The pamphlets were also a form of mass entertainment in a society where the printing press was just coming into widespread use. The German pamphlets painted Dracula as an inhuman monster who terrorized the land and butchered innocents with sadistic glee. The Russian pamphlets took a somewhat different view. The princes of Moscow were at that time just beginning to build the basis of what would become the autocracy of the czars. They were also having considerable trouble with disloyal, often treasonous boyars. In Russia, Dracula was presented as a cruel but fair prince whose actions were directed toward the greater good of his people. Despite the differences in interpretation the pamphlets, regardless of their land of origin, agree remarkably well as to specifics. The level of agreement between the various pamphlets has led most historians to conclude that at least the broad outlines of the events covered actually occurred. Romanian verbal tradition provides another important source for the life of Vlad Dracula. Legends and tales concerning the Impaler have remained a part of folklore among the Romanian peasantry. Many of the tales contained in the pamphlets are also found in the verbal tradition, though with a somewhat different emphasis. Among the Romanian peasantry Dracula is remembered as a just prince who defended his people from foreigners, whether those foreigners be Turkish invaders or German merchants. He is also remembered as somewhat of a champion of the common man against the oppression of the boyars. Dracula’s fierce insistence on honesty is a central part of the verbal tradition. Many of the anecdotes contained in the pamphlets and in the verbal tradition demonstrate the prince’s efforts to eliminate crime and dishonesty from his domain. There are several events that are common to all the pamphlets, regardless of their nation of origin. Many of these events are also found in the Romanian verbal tradition. Specific details may vary among the different versions of these anecdotes but the general course of events usually agrees to a remarkable extent. There are about nine anecdotes that are almost universal in the Dracula literature.